Are you suffering from Anuptaphobia? Does the thought of being single make you feel uneasy and depressed? Do you feel resentful when you see happy couples or feel the need to gobble up a pint of ice cream to ease the pain of being alone? 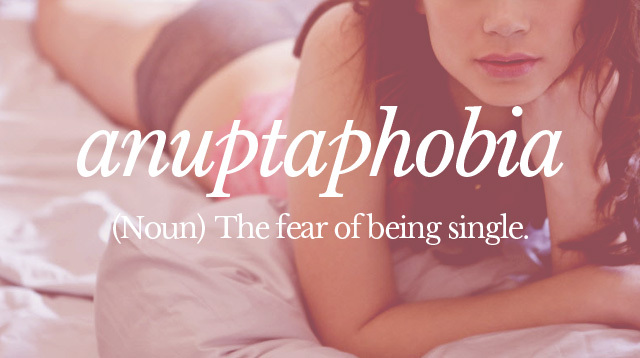 You may be suffering from anuptaphobia or the fear of being single. Anuptaphobia is medically defined as "the fear of staying or remaining single," and a growing number of people are suffering from it. This phobia haunts women and men alike, as the fear of being alone for the rest of their lives cripples them into despair. But what most of us don't realize is that this fear is merely a temporary state. Being single is not a disease. Being single doesn't mean you're unhappy. It just means you haven't met the right person yet, or you're at a point in your life where your priorities lie outside of being in a relationship. In fact, there are many people who are single and perfectly content with their lives. So don't let anuptaphobia discourage you, CGs. You will overcome it. Focus on all the things you love about yourself, because that's where true happiness lies.